If you like to shop on your holiday, Prague offers some unique and interesting items for you to take home, and my new Prague Shopping Guide will steer you in the right direction! From crystal to glass to handmade marionettes, you can find something for everyone on your gift list (as well as for yourself!). When it comes to take-home treasures, the Czech Republic is probably more famous for its crystal than anything else. Now, in addition to the very traditional cut crystal for which it was historically known, lots of modern designs are now on the market, with fabulous art glass also making a splash on the shopping scene. The Czechs also love marionette theater, so they also produce fantastic handmade wooden marionettes that you can take home with you (as well as cheaper mass-produced ones, in case you don't want to spend a lot on a toy that the kids might mangle!). While the shops with hand-carved puppets are becoming hard to find, there are still a few in Old Town for you to check out. Here is a list of some of my top picks for shopping in Prague. 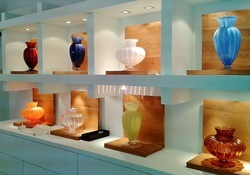 Artel - One of the newest and most exciting entries on the Czech crystal market is Artel. American artist Karen Feldman has worked magic with her designs, which are then rendered by Czech master glass blowers from the Northern Bohemian region. Erpet - This mega store on Old Town Square carries just about every kind and style of traditional and more modern Czech crystal, glass, and porcelain to be had. They also carry garnets, the stone for which the Czech Republic is famous. Material - The unique and modern vases and chandeliers in this place are a feast for the eyes. The colors they employ also add uniqueness to Mterial's pieces. Where else can you find a jet black chandelier? They also have a fantastic assortment of beads from which you can create your own special necklaces and bracelets. Mozer - This is considered by most to be the finest brand of Czech crystal. Polished to perfection and weighty, one only has to pick up a Mozer wine glass to know that it is special. They don't call it "the glass of kings" for nothing! Borek Sipek Glass - This artist has made his mark with his incredibly unique designs. Visiting his showroom is like visiting an art exhibit. If you like funky and modern, this is for you. Truhlář Marionety - This shop near the foot of the Charles Bridge on the Mala Strana side is one of the best in Prague. Stroll through the many characters hanging through hooks on the ceiling in this carpenter's workshop. Marionety - Located in the Ungelt courtyard behind the Tyn Church in Old Town, this shop also offers more authentic, wooden puppets. Botanicus - This shop is also located in the Ungelt and carries handmade soaps, oils, lotions and more. The wide array of Botanicus' products are made from ingredients grown on a farm nearby. And they make good gifts to take home: they're lightweight, relatively inexpensive, and, for the most part, unbreakable (which makes them perfect for packing!). Manufaktura - Similar to Botanicus, this brand's many locations offer handmade soaps and other items, but it also carries a great selection of handmade wooden Czech toys and other handicrafts, like Christmas decorations and hand-painted Easter eggs. Shakespeare and Sons - This, along with the Globe is one of only two English language bookshops remaining in Prague (there used to be four). This one is located in Mala Strana near the foot of the Charles Bridge. 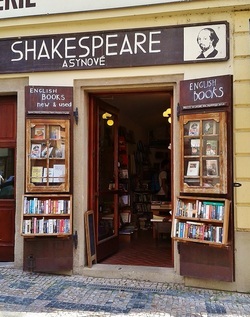 Shakespeare and Sons features an impressive selection of books on Prague, the Czech Republic and Central Europe, including English translations of many books by Czech authors. The Globe Bookstore and Cafe - This was Prague's first English language bookstore (though it was not originally in this location). It's a bit south of the historical center, but if you go to see the Frank Gehry's "Dancing House," you can pop in the Globe which is nearby. Franz Kafka Bookshop - This bookshop located in the Kinsky Palace on Old Town Square has a fairly good selection of English language books about Prague in its mostly Czech collection. It also has a large array of art books. For more information on all of these shops as well as other Prague shopping tips, see my new book, "Prague Shopping Guide: From Trinkets to Treasures." For more great shopping tips, check out my unique Prague Shopping Guide .